Let’s talk about the pros and cons of each of these. 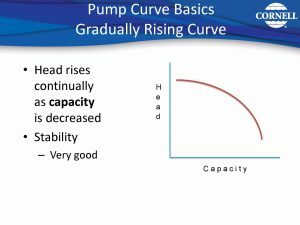 If you start on the right side (maximum capacity) of a gradually rising pump curve, you will have a nice arched shape, and head (pressure) increases continually as capacity is decreased, and you move to zero flow. 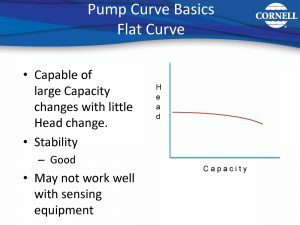 This pump will provide a medium change of head (pressure) as the flow increases or decreases, and pump operation is very “stable” as the flow and head relationship are well defined throughout the pump curve. This type of performance is usually preferred, as it usually is very compatible to most sensing/control accessories that may be used to control the pump. 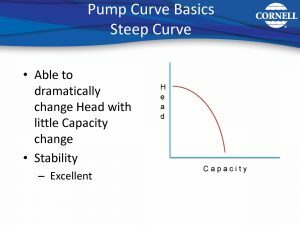 With a steep centrifugal pump curve, you will have a steeper arch, resulting in a larger head (pressure) increase as the flow decreases, compared to the gradually rising curve mentioned above. This performance may be desired with some sensing/control equipment where a larger pressure differential is preferred, and with system requirements that have large pressure demands with fairly small flow changes. The stability of this curve is excellent due to the steeper continuously rising shape. 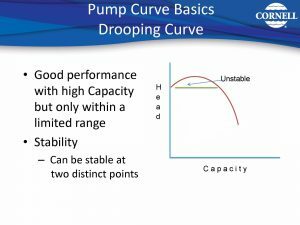 An operator may prefer a fairly flat pump curve in some systems, where he/she would like very little pressure increase as the pump flow decreases. In addition, the operator/designer would not need to be concerned about building large pressure levels as the flow varied, and could possibly use lower pressure rated piping and accessories. The pump stability of this curve is good. 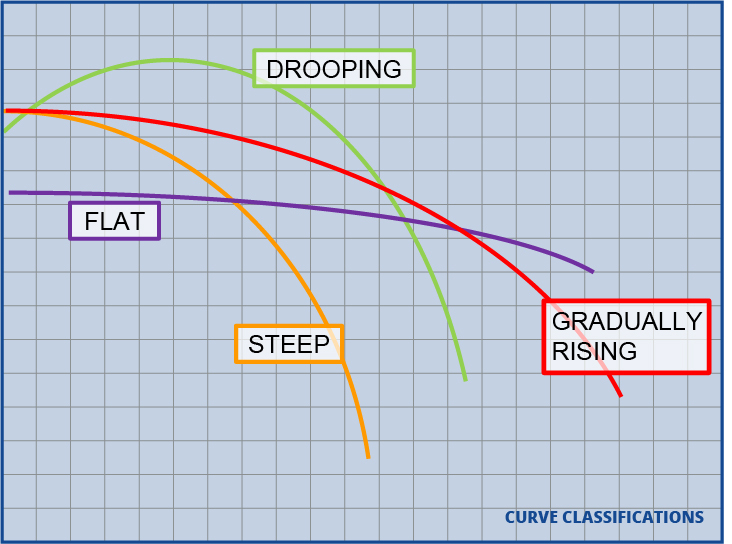 The fourth pump curve type is a drooping curve. As shown in the illustration, this curve shape is not stable in the area where there are two flows where the head (pressure) can be the same, in the low flow portion of the pump curve. This pump should be operated in flow ranges beyond (higher) than the area of instability in order for it to operate smoothly and efficiently. This pump would operate with a narrower acceptable flow range for that reason. I f you have any questions regarding proper selection of your Cornell Pump, please contact any one of our technical salesmen for assistance.